This year’s Highway Africa Conference, which gathers journalists from across the continent, focused on the growing migration of Africans to cities and what that means for African journalism. Who is going to tell this story? Whose voices are heard in urban journalism? Is hyperlocal media still an option? What can Africans do continent-wide to embrace this trend and take command of their own futures? A dynamic lineup of panelists and speakers raised a wide diversity of thoughts on other topics as well, such as Internet governance, digital tools for newsrooms, and citizen participation in an era of technology. At times, six concurrent sessions discussed some of the many issues African journalists face. While it was impossible to attend every single workshop, three major themes permeated the conference. The broad scope of #HA2015 (August 30-31) highlighted the move of citizens to the city, but many conversations focused on the importance of engaging at the local level. “Local governments need to establish local ties at the local level with local cities,” said Jean Pierre Elong Mbassi, the secretary general of United Cities and Local Governments Association. How we tell stories in small towns, villages, and the rural areas of a country is important. Nearly every conversation addressed the concept being a resident–no matter if you are a journalist, government official, or average citizen, you are a resident in an area and you interests in common with your fellow residents. While there are endless distractions in today’s media ecosystem, entertainment will not supplant the need for information about jobs, crime, and water. Harry Dugmore, a professor at Rhodes University, argued that stories must be told in an interesting way but that resources and revenue go hand in hand. A news outlet won’t be able to stay in business without using video, images, and good reporting. It was abundantly clear that participants at this conference want and need hyperlocal media outlets to succeed—but there was little follow through on conversation of exactly how to make this happen. The theme of Africa’s growth permeated the conference, from discussions about Africa’s role in Internet governance debate to a compelling speech by Eddie Ndopu from Amnesty International encouraging young Africans to rise up and make change on the continent. Pierre Dandjinou, the vice president for stakeholder engagement at ICANN, as a continent of 1 billion people, Africa can not only be a consumer; it must also produce, sit at the table, and know what is going on continent-wide in order to keep the internet open to sustain growth. He also noted that theInternet is no longer about English, French, or Spanish–language can be an issue, but the tools are available to translate any language on to the Internet. No matter the topic, it was clear that thought leaders at the conference wanted African journalists to take ownership of these issues, engage all relevant stakeholders, ask tough questions, and ensure that the wealth of these growing economics stays on the continent. But the event lacked any exploration of the how. How are we going to empower Africans to take control of their own future? How can we be sure that there is enough education and training for journalists on the ground? How can we convince the African media to report continent-wide while also remembering the importance of the local level? How can we increase capacity development throughout the continent? How can we ensure that hyperlocal media outlets don’t crumble for lack of funding? The international community generally agrees that change in Africa should be driven by Africans–but there needs to be some follow-through on the ground. Who can lead the charge, and how can we find more people to engage continent wide? As conference organizers look ahead to the 20th anniversary of Highway Africa, I hope they consider the value of brainstorming solutions to these problems. The drive and determination of the journalists at the conference proves that the ambition to sustain independent media systems exists in Africa. To watch panels from the conference, check out Highway Africa’s YouTube channel here. 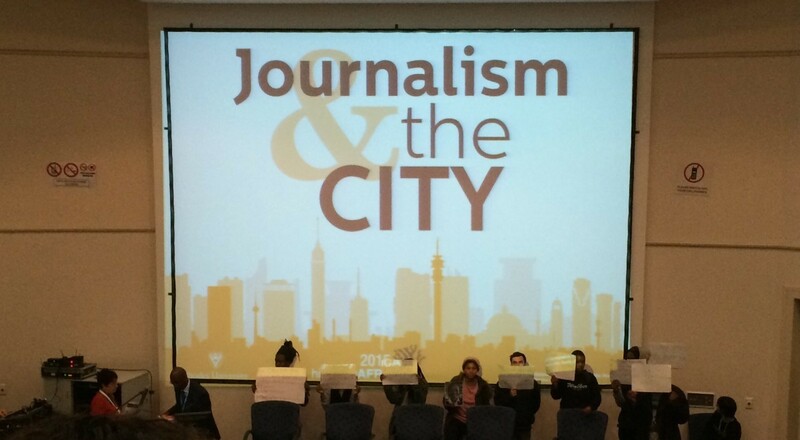 Follow @HighwayAfrica using #HA2015 and #cityjournalism for more information.